They say the best gifts come in small packages, but we believe the best gifts come in beautifully wrapped packages! 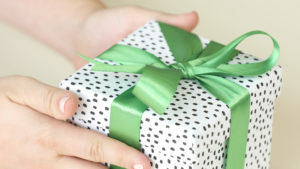 After all, if the giver has taken the time and care to wrap to perfection, what’s inside is bound to delight. 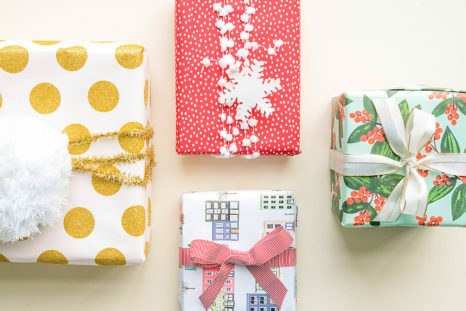 This holiday season, take a few extra moments to wrap your gifts with a whimsical touch. We’ll teach you a few techniques (from perfectly measured paper, to folding clean corners, to picking and tying the perfect ribbon) so that you can wow your friends and family. As candy cane season approaches, the time to reach out to loved ones with warm wishes is also near. While technology makes it easy to keep in touch, nothing really says ‘I love you’ like a thoughtful, handwritten letter. The art of a handwritten letter honors traditions of the past and serves as a timeless memento to the present. 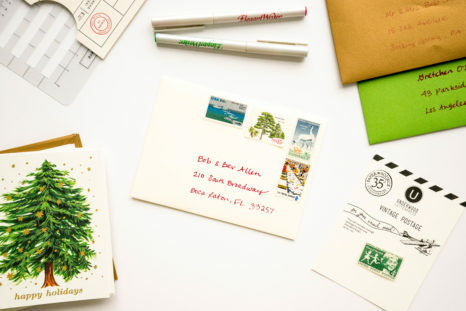 Here are the top five reasons why you should put pen to (really pretty) paper this holiday season. Easy and Thoughtful Hand-Made Holiday Gift Guide! Trying to find the perfect gift that feels thoughtful and meaningful can be hard when online shopping makes everything so accessible. With so many options, gift giving sometimes loses the feeling of surprise and delight you get when both you and recipient open their gift. Creating a hand-made gift is our favorite solution! A hand-made gift offers personal touches, creativity, thoughtfulness and often is more budget friendly than buying a gift from the store. We have rounded up some of our favorite DIY gifts that are quick and easy to make before your next holiday party! Just as you take the time to wrap gifts in pretty paper and perfect bows, give your correspondences the same personal touch with DIY envelopes. With the right tools, making your own envelopes is a cinch. Follow our guide to see for yourself. Nothing makes a sweeter statement atop a gift than a perfectly tied bow. And with endless pattern and color combinations, it’s the perfect skill to master for any season. Follow our guide for all of the pro-bow tying tips you’ll ever need. Friendsgiving is a time to celebrate the bounty of the harvest season without the stress that often comes along with extended family gatherings. The menu is easy enough: The host provides a turkey or vegetarian main, and the guests bring along sides, potluck-style. Getting the table ready doesn’t need to be a headache, either. With some beautiful pieces of fine paper, a touch of inspiration, and a dash of creativity, you can transform an everyday table into a feast-worthy masterpiece. Follow our guide to craft centerpieces, name cards, and table runners that strike just the right balance of casual and elegant — just like your Friendsgiving feast. Table Runner: Make a sweet statement with a simple paper table runner. It’ll make your dishes pop, and mean one less load of laundry at the end of the night! Measure your table lengthwise, allowing an extra three-feet for each side. Using sturdy paper bag wrapping paper, lay the paper out on the table and make sure it is centered, width-wise. Using your hands, make a crease on the paper and mark where the table ends. Hand-letter your table message with chalk ink markers, centering it between the creases and the ends of the paper. Centerpiece: With a table full of dishes and glasses, and plenty of lively conversations, you don’t need an over-the-top Friendsgiving centerpiece. A few decorated pumpkins add a dose of whimsy to the tablescape without taking up too much space. 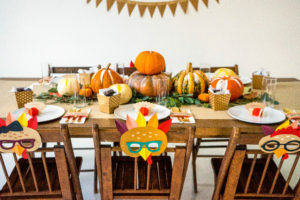 Use paints in your choice of colors, autumnal-themed paper leaves, and other natural elements, like greens, berries, and pinecones, to decorate and embellish the pumpkin. 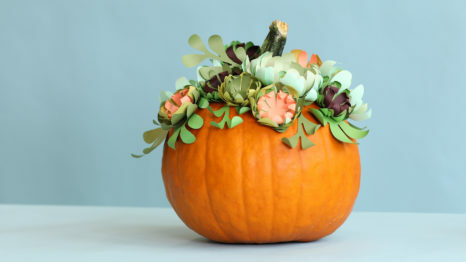 Place the pumpkin in the center of the table, and arrange greens and paper leaves around the pumpkins. Name Cards: Even though Friendsgiving isn’t formal, guests will appreciate having assigned seats to avoid confusion before the feast. Keep it light hearted with turkey-themed name cards that won’t take up too much space at each place setting. Create name cards using our honeycomb turkey place cards and pens. 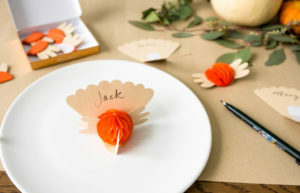 Simply unfold the honeycomb turkey and write each guest’s name on each individual card. Place a name card in the center of the dish for each place setting. Utensil Holders: Keep cutlery organized on the tabletop with a handmade utensil holder. A sleek paper sleeve will tidy up forks, knives, spoons, and napkins. Using your choice of fine paper, measure out two or three inch paper strips. They should be long enough to easily wrap around a folded napkin. Optional: Cut a slightly larger band of colored paper and place it below the first for a layered effect. Choose a stamp and ink to personalize the band. Wrap each band around a bundle of cutlery atop a napkin, and afix the band in the back with a small strip of tape using a tape runner. Place each package to the side of each guest’s place setting. 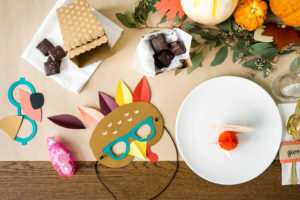 Treat Boxes and Festive Masks: Cute, creative gifts make special mementos for your Friendsgiving guests to remember a night of gratitude and great food. Fill treat boxes with tissue paper and nestle a few tempting candies, like salted caramel chocolates, into the paper. 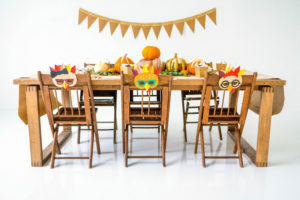 Using our Turkey Mask Kit, craft a mask for every guest, and hang them over the back of each chair where they’ll be ready to grab for a photo opp. 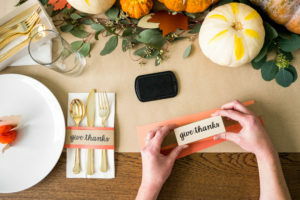 These small, personal touches will make your table shine so that you and your friends can focus on enjoying the company and feasting on every delicious dish. 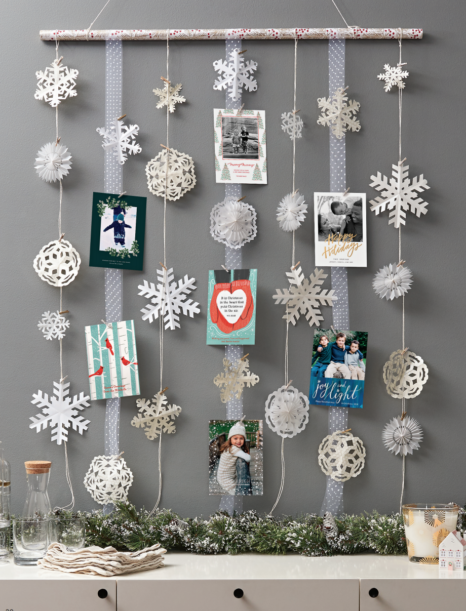 ‘Tis the season for holiday cards – display them with a beautiful wall hanging. This lovely DIY uses just a few materials and is quick and easy to make. 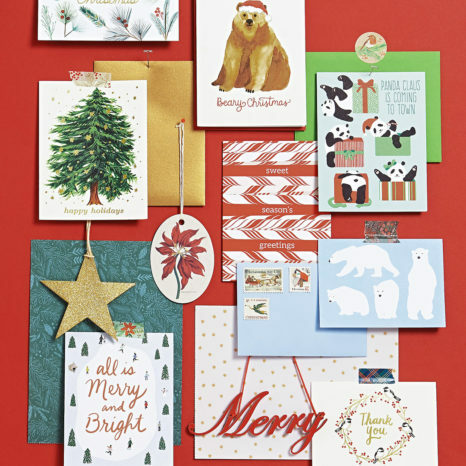 Follow these steps to create a display worthy of showing off cards from friends and family! 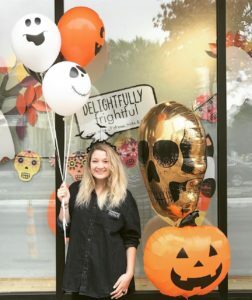 You’re Invited: Paper Source’s Halloween Trick-Or-Treat Party! On Saturday, October 27th and Sunday, October 28th Paper Source will be hosting a Halloween Trick-or-Treat Party at all store locations! Our delightfully frightful celebration will include spectacular party activities to get you in the Halloween spirit. Check out the full list of activities below and be sure not to forget your costume!